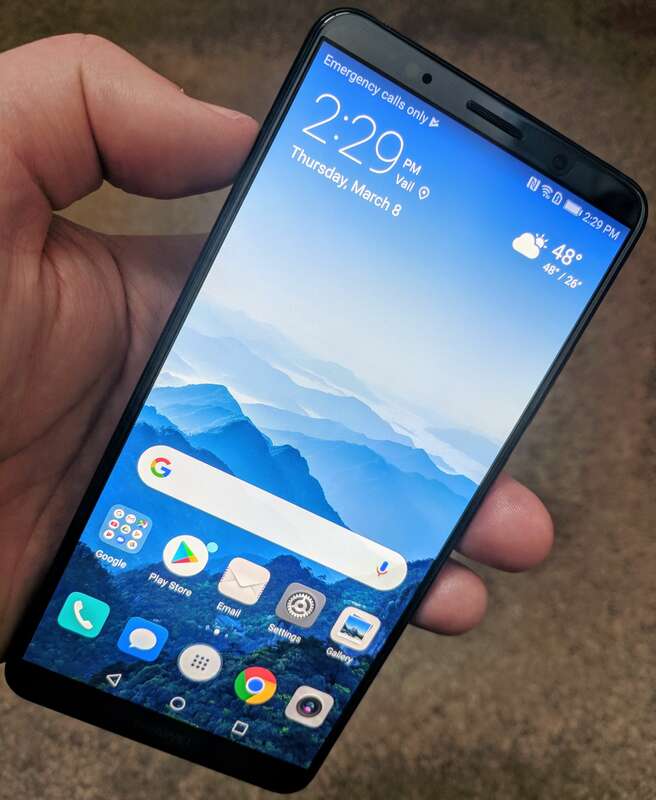 If you are looking for a flagship class device that has all of the power and performance you would expect from such a device, the Huawei Mate 10 Pro needs to be on your short list. It is impressive and it is a great step forward in the Mate series of phones from the manufacture. They have made big steps in their Kirin 970 processor but also the AI built into the platform is very good. Then there is the massive – and I cannot overstate it enough – improvements in EMUI 8. It finally is allowing the awesome design and performance of Huawei phones to shine through. As for me, it scores a 4.9 out of 5 which is the highest score I’ve ever given a phone in a review. Physically, the Huawei Mate 10 Pro measures 154.2 x 74.5 x 7.9mm in size. That’s 6.07 x 2.93 x .31 inches in old money. It weighs 178g or 6.28 ounces. It is an all aluminum chassis with an aluminum body that is covered in glass. This gives the phone a flagship look and feel when you hold it but, as you would expect, the glass body can get fingerprint covered pretty quickly. The Huawei Mate 10 Pro is powered by the Kirin 970 SoC designed by Huawei. It is an octa-core design with four cores running at 2.36GHz and 4 running at 1.8GHz. This is coupled with the Mali-G72 GPU and the Mate 10 Pro is the first phone on the market with that GPU. Add to this a new Neural Network Processing Unit (NPU) which brings a significant increase in performance for AI-related tasks. As I put in my review of the Mate 9 and the P10 last year, the Kirin SoC’s are some of the fastest processors out there and this year’s update to the 970 continues that theme. The Mate 10 Pro is stunningly fast. From a RAM and Storage perspective, you have 6GB of RAM and 128GB of storage. The storage cannot be expanded but with 128GB on board, you likely wouldn’t need it anyway. Display wise, you have a 6″ 18:9 OLED display that renders at 2160 x 1080. That gives you a very comfortable 402ppi (Pixels Per Inch) that makes viewing the display for a long time easy on your eyes. I’ll cover the display in more detail later in the review but overall it is outstanding. Bluetooth 4.2 with support for LE and aptX/aptX HD is provided and as for WiFi, that is dual band 802.11 a/b/g/n/ac. You also have DisplayPort support through the USB-C 3.1 connector. 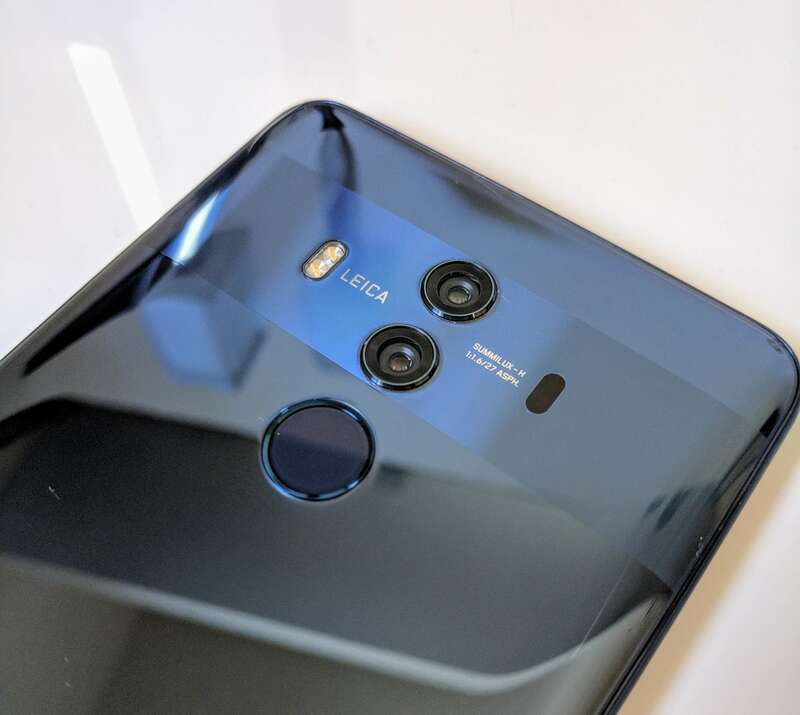 Camera wise, Huawei has once again collaborated with Leica to give you stunning photo quality. The rear camera is a dual camera configuration. The main camera is a 20MP shooter that is coupled with a 12MP monochrome camera. Both lenses have an f/1.6 aperture, another first for a mobile phone. It has OIS (Optical Image Stabilization), a dual-LED flash, and has PDAF (Phase Detection Auto Focus) and Laser auto focus. You have a 2x hybrid zoom and video wise, you can shoot native 4K videos. As with many flagship devices today, the Huawei Mate 10 Pro is IPS67 rated for water and dust intrusion. That gives you the freedom to use it in just about any condition without worrying about damaging the device. Powering all of this is a built in 4000mAh battery which supports Huawei’s SuperCharge technology. A 10 minute charge will allow you to go from 1% to 20% of battery life while a 30 minute charge will let you go up to 58%. Huawei is known for having some of the best battery saving features built into their phones to help stretch that battery life as long as possible and the Mate 10 has all of those tricks too. Finally, the Mate 10 Pro runs Huawei’s EMUI (Emotion UI) variant of Android. Specifically, it runs EMUI 8 which is based on Android Oreo 8.0. 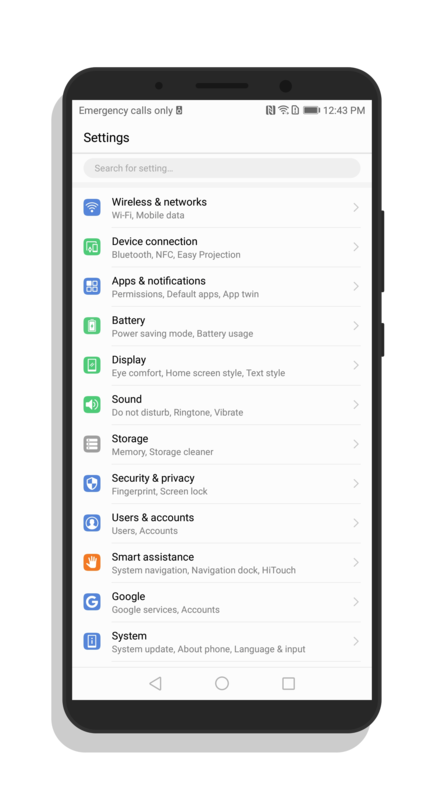 EMUI has all the features of Oreo but also includes some heavy AI elements to optimize the user experience. More about that later in the review. From a specifications perspective, you will be hard pressed to top this phone. It is a powerhouse with a battery to keep you going all day and, since it is IPS67 rated, you can do it in just about any conditions. While the Huawei Mate 10 Pro is unquestionably big, it is not overly so and feels quite comfortable in your hand. The front of the device is dominated by the display, which is edge-to-edge on each side and sports small bezels at the top and bottom. Above the display is where you will find the speaker, front facing selfie camera and proximity sensor while the bottom bezel just has the Huawei logo on it. On the left side of the phone you will find the Nano SIM tray at the top but otherwise it is smooth and uninterrupted. The volume rocker and power button are found on the right side of the device. On the top, you will find one of the two microphone ports for the phone with the other located on the bottom edge of the device. The bottom edge is where you will find the USB-C connector and speaker grille. There is no headphone jack on the Mate 10 Pro which has become somewhat of the norm for flagship devices. You are provided USB-C headphones in the box however. On the back of the Huawei Mate 10 Pro you will find the dual Leica camera configuration. The cameras are arranged vertically with the dual-tone LED flash to the left of them. Just below the cameras is where you will find the fingerprint scanner. As has been the case with previous Huawei phones I have reviewed, the fingerprint scanner is stunningly fast. As with other glass-on-aluminum phones like the Samsung Galaxy S8 and S9, the Huawei Mate 10 Pro shows fingerprints easily. For some users, this may be a big deal as the phone looks “dirty”. Truthfully, it isn’t that big of a deal but comes down to personal preferences. That chassis design also lends the phone to feeling solid but smooth in your hand. The phone feels premium when you pick it up, hold it, and use it. Simply put, the Mate 10 Pro is an absolute powerhouse. The Kirin 970 SoC is stunningly fast and the device feels amazingly responsive. I would contend that you will find very few phones that can compete in a straight up street fight with the Mate 10 Pro on pure horsepower under the hood. 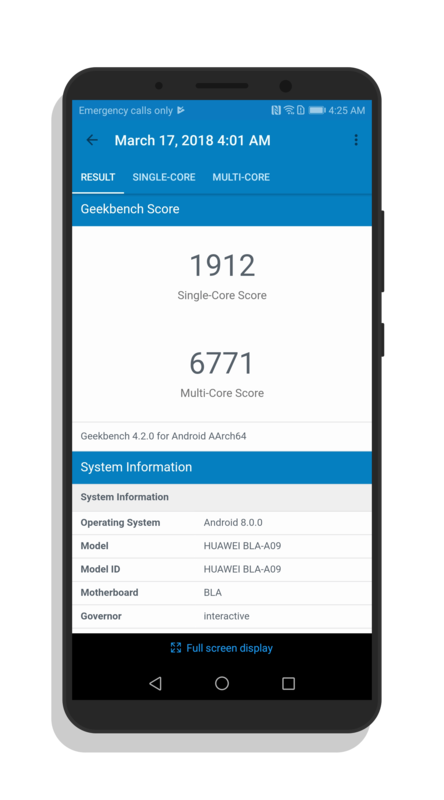 Being a bit more objective about it, the Geekbench 4 scores for the phone speak for themselves. 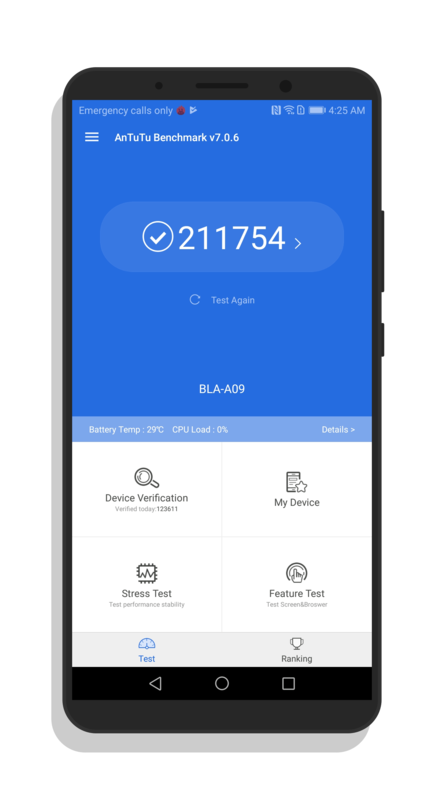 On the Single-Core test, the Mate 10 Pro scored 1912 while on the Multi-Core test, it scored 6771. Those were the top scores of any devices using that app and on the Multi-Core test, was some 1500 points ahead of the Galaxy Note 8. Running AnTuTu Benchmark, the results were equally as stunning. Overall, the device scored 211754 which puts it in the top 4% of all phones out there. 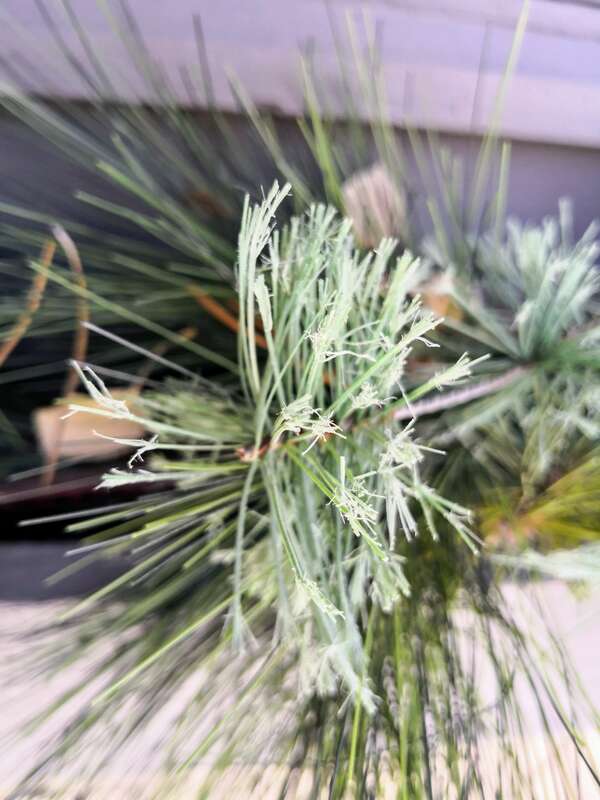 While objective test scores are good, it is the day-to-day use of a phone that matters and in my using the Mate 10 Pro as my daily phone, it was more than up to the task. I was easily able to stream content from Netflix and Amazon Prime, play games like Real Racing 3, Angry Birds 2, and the Room 3 without any lag or hesitation in rendering. Of course it was quite capable of handling the mundane things like Gmail, Google Calendar and the like too. Coupled with the overall performance is the display performance. First, the color accuracy of the display is excellent. You will find it to have a high level of contrast and in its default mode, to be slightly cool but not overly blue. It is a bright, vivid display but not overly so. The high PPI count makes viewing the screen for long periods of time easy on your eyes. Second, the touchscreen performance is outstanding. This is, of course, dependent a bit on the SoC itself powering everything but there have been plenty of phones that have had strong processors and a poor digitizer. You won’t find that on the Mate 10 Pro. The screen it responsive to touch and it accurate in its targeting. So let’s be clear up front: The camera on the Huawei Mate 10 Pro is stunningly good. When I reviewed the Mate 9 last year, I found the camera quality okay and to their credit, Huawei improved it through software updates throughout last year. But with the Mate 10 Pro, they seemingly got it right the first time. Color accuracy and saturation is excellent and let’s be honest, having Leica optics, dual cameras, and 20MP isn’t going to hurt your cause either. I shot a wide range of photos both inside and outside with the phone and was impressed with all of them. You can find them all in the gallery at the end of the review. If you have used a Huawei device in the past, the camera UI is going to feel very similar to the past. Swipe right to get to different modes while swiping right will get you to the different settings. One of the coolest modes is the 3D Panorama mode. Just play with it. It is super cool and a great example of the AI that is built into the app. Also, the camera app detects different scenes automatically to give you the best color and contrast for that scene. Again, this is driven by the AI of the device. With a 4000mAh LiPo battery, you would expect long lasting performance from the Mate 10 Pro and it delivers. 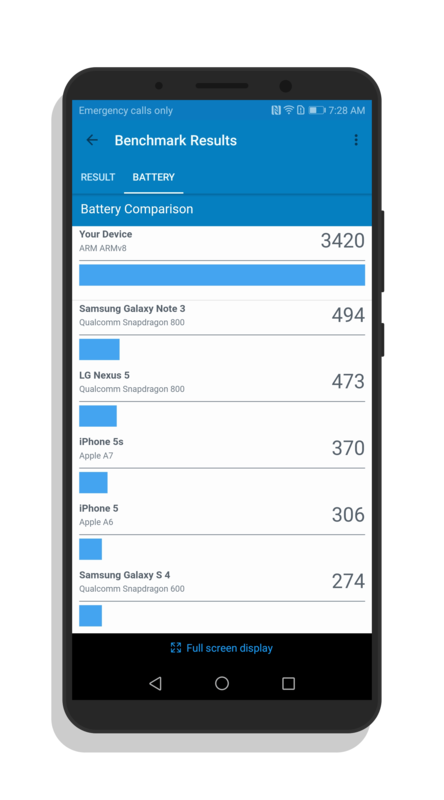 Using the battery benchmark testing in GeekBench 4, the phone was miles ahead of other devices tested. Again, going to the real work perspective on the battery, it had no problem keeping up with me all day as I used it as my daily driver. In fact, over the weekend, I purposely left it unplugged and used it as I normally do. The result was me being able to get nearly 1.5 days out of the phone. It was impressive. Huawei has built a lot of battery saving features into EMUI and they are still there on the Mate 10 Pro, just improved. You still have the option for an Ultra Power Save mode which will give you over 3 days of battery – just don’t expect any notifications or background app activity. Finally, the quick charging feature of the Mate 10 Pro, aptly named SuperCharge, makes charging quick and is on par with Quick Charge 4.0 technology from Qualcomm. Perhaps the single biggest improvement to the Huawei Mate 10 Pro over last year’s Mate 9 is EMUI 8. Huawei has over the years, for the most part, gotten their phones right from a performance and feature perspective. However, because EMUI was so clunky, that performance and overall great design was hidden behind a frustratingly disjointed deployment of Android. That has now changed. EMUI 8 is based on Android Oreo 8.0 so you are getting the latest and greatest with this phone. But what is really improved with EMUI is that it is much more “stock” Android feeling than ever before. If I do a stare-and-compare of Settings on the Mate 10 Pro to my Pixel XL, things are pretty much laid out the same. Things are also labeled more clearly and there aren’t nearly as many buried things in settings as there has been in previous iterations of EMUI. Huawei has also built a lot of Artificial Intelligence into EMUI 8. It learns, of course, how you use the phone which is something the company introduced in their first real AI included version of EMUI, 4.0. But the AI in version 8 is far beyond those early days. Leveraging the NPU, it optimizes app performance continually so apps are always running at peak performance. Plus, it also proactively suggests switching into Oreo’s supported split-screen mode when it detects you are doing something and don’t want to interrupted. So for example, streaming Netflix on one side of the screen while chatting on Hangouts on the other. Overall, if you like “stock” Android, you are not a mile away from it with EMUI 8. You still have the fun bits of EMUI like themes but navigation and usability of it has taken a huge step forward since the last version. I actually like EMUI now to be honest as I find it more akin to my Pixel XL and frankly, I’m not fighting any more. It just works. The only thing I would change really is getting rid of the App Drawer button and just do a swipe up to get to my apps. The Huawei Mate 10 Pro is available from a wide range of online retailers including Amazon.